Long-term care involves the need for a range of services and support due to a chronic illness or disability. Generally speaking, long-term care does not involve medical care. Instead, it concerns the need for assistance with the activities of daily living. 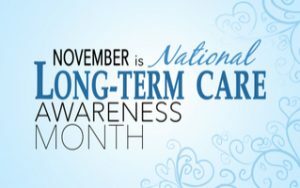 Many people require long-term care, which is why the month of November was designated as National Long-Term Care Awareness Month. According to the National Family Caregivers Association, roughly 78 percent of adults that receive care at home depend on friends and family as their only source of care. There are around 45 million informal caregivers in the U.S. and, according to the AARP, the typical caregiver is a woman that’s on average 46 years old. According to the National Alliance for Caregiving, caregivers spend around 26 hours a week providing care for a loved one. The Center of American Progress revealed that 41 percent of family caregivers had to take a leave of absence to provide care for a loved one, with 37 percent having to switch from full-time to part-time. According to the Volunteers of America, 29 percent of caregivers use their own savings to provide their loved ones with the long-term care they need. More and more people are requiring long-term care because they are living longer than before. A hundred years ago, the average American life expectancy was only 47. It’s now 78. As far as demographics go, more women need long-term care than men. Around 3 out of four assisted living residents are women and almost twice as many women over 65 are receiving long-term care at home than men. This is in part because women tend to live longer. The average length of the long-term care a person needs is around three years, according to the National Center for Health Statistics. Because of this, it’s important to plan for the possibility of long-term care to avoid financial problems. For more health information and advice, be sure to visit us at The Benefits Store today. There’s a lot that we do not know about how viruses work; however, the continued work by research teams across the world is changing this. For example, a group of researchers at the Rutgers Robert Wood Johnson Medical School recently pinpointed a vital step in the process that allows the body to fight viruses. In fact, their research also revealed how mutations that derail this process to fight viruses lead to autoimmune disorders. A virus spreads by replicating itself within a host cell. The immune system has intricate mechanisms in place that help to defend against both common viruses and emerging viruses. Researchers studied the process in which RIG-I (an immune protein) searches for viral RNAs. Once the RIG-I finds a viral RNA, it activates the antiviral response of the cell in which it was found. A butterfly constantly flutters to and from anything that looks like a flower. Like a butterfly, the RIG-I immune receptor constantly investigates the RNAs in the cell in order to identify viral RNAs. 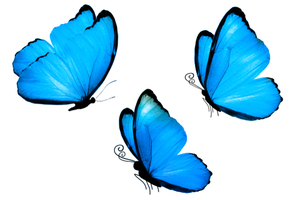 Essentially, RIG-I (and butterflies) are involved in a continuous cycle of association and disassociation. Once the RIG-I discovers a viral RNA, it stops its search and signals its multiple molecules to gather on the viral RNA, which in turn, activates the antiviral response of the cell. RIG-I immune receptors are supposed to move on if they do not identify viral RNAs. However, an autoimmune disorder known as Singleton-Merton syndrome interrupts this process. Instead of moving on to other RNAs, mutated versions of the immune receptors remain and become trapped in the RNAs, causing abnormal immune responses. The research revealing the details of this process could potentially be used to leverage RIG-I immune receptors in both antiviral and cancer therapies. Stay up-to-date on all the latest health-related discoveries and news by visiting us at The Benefits Store today. 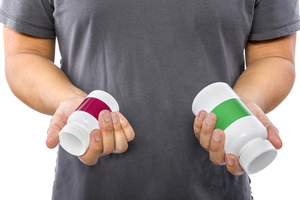 Medication can be quite expensive, which is why many people opt to buy generic drugs instead of name-brand drugs. Generic drugs often do the exact same thing as name brand drugs but are much more affordable. Unfortunately, a new study by the USC Schaeffer Center for Health Policy & Economics revealed that generic drugs are going up in cost. Even generic heart medications and antibiotics are increasing in price, according to the USC study. More generic drugs are beginning to double in price year-over-year. In 2007, only one percent of generic drugs doubled in price from the previous year. In 2013, 4.39 percent of generic drugs doubled in price. One of the reasons there has been such a sharp spike is due to a new strategy employed by manufacturers to enter therapeutic areas that have little competition. They then raise their prices significantly. This has led to outrage amongst the public, especially about medicines that patients need to stay alive. It has led to many questions from critics concerning whether the generic drugs’ market is still effective. Generic drugs not only take up 90 percent of the prescriptions that are filled throughout the country, but they’ve historically been available at lower costs that even decreased over time. The study revealed that even though the prices for most generic drugs actually declined from 2007 to 2013, the number of generic drugs that doubled in price during that time period grew 400%. It was found that the cause behind these increases mostly had to do more with a lack of competition than a shortage in supply. Patients’ out-of-pocket costs have not increased as a direct result of increased generic drug costs. However, that could change if insurers respond to continually increasing prices by raising premiums. To stay up-to-date with all of the latest health news, be sure to visit us at The Benefits Store today. Last year was one of the worst flu seasons in decades. According to the U.S. Surgeon General, some 80,000 people died during the 2017-2018 flu season. As a result, there’s been a significant effort to increase awareness and to get people to go get their flu vaccine as this year’s flu season begins. Among those that died as a result of the flu last year, 180 of them were children, most of whom were not vaccinated. In fact, it’s estimated that more than 40 percent of American children did not get vaccinated for the flu last year. The number of children between the ages of six months and four years that weren’t vaccinated increased as well. Besides the surprisingly high death toll, the flu caused serious enough problems that 900,000 people were hospitalized as a result. Although the flu season lasted from October to May, it was in November that the virus began to really have a huge effect. In fact, last year’s flu season was the first to be considered “high severity” for people of all ages. Getting a flu vaccination every year is the responsible thing to do. Not only will you protect yourself from getting the flu, but you’ll help prevent the virus from being spread to others. Some inoculated people may get the flu but it may not have a big impact on their health. Their bodies may be able to fight it off within a week or so. However, if they aren’t vaccinated, they could spread it to others and cause them more serious health problems. It’s particularly important for the elderly, children, pregnant women, and adults who have chronic health problems to get their flu shots. Because different strains of the flu spread every year, it’s also important that you get your flu shot before every flu season. Flu vaccinations are not lifetime vaccinations. For more information about the upcoming flu season or to stay on top of all health-related news, visit us at the Benefits Store today. As common as the cold is (After all, it’s referred to as the “common cold.”), it’s surprising how little we know about it. Maybe that’s why there’s no cure. However, researchers have recently revealed that the severity of the symptoms a person might experience due to a cold could be linked to the type of bacteria in their nose. 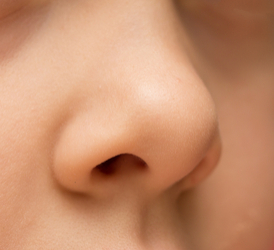 Researchers studied 152 participants by analyzing their nasal bacteria. The participants were studied before and after being infected with the same cold virus. It was determined that participants who had the most Staphylococcus bacteria in their noses suffered the most severe cold symptoms. The mix of bacteria in their noses was also linked to how much of the virus was in their body. This means that the background bacterial pattern in the participants’ noses influenced how they reacted to the virus and how sick they got. While these findings are certainly interesting, they don’t prove a cause-and-effect relationship between the type of bacteria in a person’s nose and the severity of symptoms. This is because there are also environmental characteristics that can influence the severity of cold symptoms. For example, you could be exposed to pollution or have certain allergies that could differentiate your symptoms. Can Probiotics Lessen Cold Symptoms? During the study, participants were given probiotics to determine whether beneficial bacteria could help reduce their cold symptoms or affect the composition of the bacteria in their noses. According to the results, the probiotics had no effect on either the symptoms or the bacteria, nor did it affect the microbiomes in the stomach. 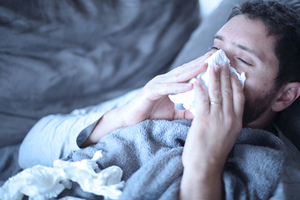 Even though the probiotics didn’t work, understanding the potential link between nasal bacteria and cold symptoms could lead to improved cold relief medications. The researchers are currently considering using probiotics in a nasal spray, a more direct approach that could have a positive effect. Stay up-to-date on all of the latest health-related news, especially during the flu season. Visit us at The Benefits Store today. California Local Association of Realtors members can take advantage of Guaranteed Association Small Group options that are offered only through the Benefits Store. "You guys are really great. I just stood up on the bleachers at my sons' baseball game and announced your praises!" "After just 4 days The Benefits Store staff accomplished more than other "industry related" staff were able to do after 30 days! Plus the staff is sincere and easy to work with!" "Since I first began working with your agency he has always found solutions, not just answers, to his insurance issues and that's worth a lot!" "Words cannot express my gratitude for the exceptional service you have provided me during the entire enrollment process. Your assistance every step of the way was very much appreciated and is not a very common occurrence in my prior enrollment experiences with matters such as this. Again, thank you so much, Kevin, Amy and Brianne for helping me and my family with the dental benefits plan." "Nothing but good things to say about The Benefits Store. Roger Smith and his staff are not only extremely knowledgeable but they care about their clients. Amazing customer service, I truly felt like I was a priority to them. I will definitely be referring friends and family to them." Thank you again for your time, help and perseverance to get this accomplished. You've given us some peace of mind regarding health coverage. Please let us know who we can commend you to at the Benefits Store."